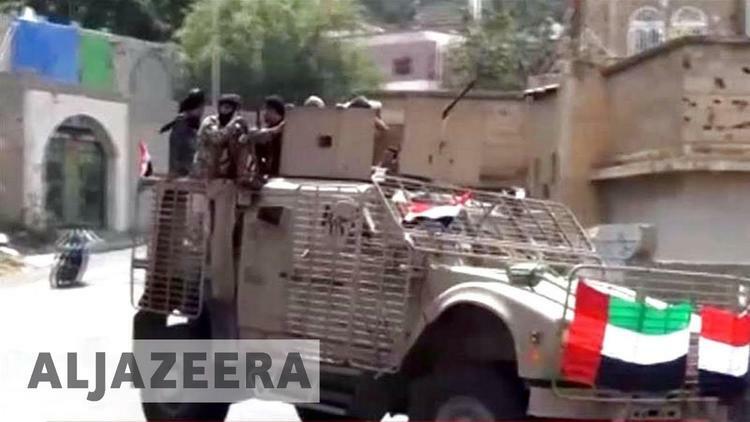 Despite an initial embarrassing claim by the Saudi mouthpiece al-‘Arabiyya that the Houthis had gained control of a government building on Sunday, it is a secessionist movement backed by the Emirates, supported by many of the southern tribes, that is fighting on the streets. If it was the case that the Saudi press is unable to tell the difference between militia of the STC and the Houthis, it should be no surprise that the coalition war against Yemen has not gone well. From Hadi’s beleaguered perspective, of course, anyone against him personally might as well be a Houthi. The fact that he and his prime minister Ben Dagher are both southerners makes this revolt even more odious. The situation is desperate, because when Aden falls, Hadi has nowhere to go, even though he has never been welcome in Aden. How bad is it? 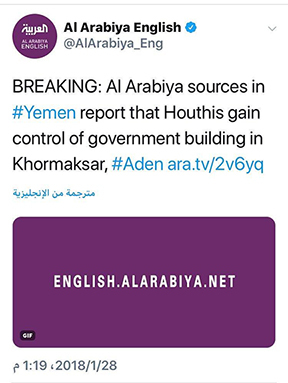 Consider this report from Reuters: “The military commanders leading the battle in the western part of Yemen (against the Houthis) have given short notice to the Saudis and the UAE to intervene to end the fighting in Aden. Otherwise they will leave the battlefront and move back to Aden to assist President Hadi and the government.” Perhaps this is less about supporting Hadi and more about leaving a battlefront where they have not been successful. The Emirates is playing a coy game. One of the major English language Emirati papers, The National, parrots the “Arab coalition” (a bloated description of the Saudi-Emirati alliance) call for an immediate ceasefire. To anyone who has been following the war from the start, it is obvious that a major sticking point has been the Saudi acceptance of Islah, the Muslim Brotherhood offshoot in Yemen, that remained loyal to Hadi (in large part because they were hounded out of Yemen by the Houthis). The Emirates views the Brotherhood as terrorists, as Saudi Arabia also officially declared, and has staked out its claim to influencing events in Yemen’s south, while the Saudis are left to bomb away and push in a few mercenaries in the north against the Houthis. Whether the takeover of Aden will force a public break in the coalition or some face-saving alibi will be found remains to be seen. Along with the news of who is fighting who, there is the prominent promotion of misinformation in almost all the reporting about Yemen. The Reuters article, for example, says “Although Hadi remains in exile in Saudi Arabia, his administration and local allies nominally control about four-fifths of Yemen’s territory.” The key word here is “nominally,” since there is barely any part of this four-fifths where Hadi could safely visit. Basically the claim is that four-fifths of Yemen’s total area (527,970 km²), second only to Saudi Arabia, is not controlled by the Houthis. But being against the Houthis does not mean being in favor of Hadi. Neither al-Qaeda nor ISIS respect the so-called “legitimate” government and attacks are routinely made by them against Hadi’s governmental officials and military. The problem with this claim is that geography is not relevant; population is. As it happens the Houthi may control less area, but within this is the majority of Yemen’s population. Also ignored in this misleading statement is that 22.2 million (of an estimated 29 million) Yemenis are defined by OCHA as people in need, 17.8 as food insecure and 3 million are internally displaced, including many people in areas under the “nominal” control of Hadi’s government. On the ground, where the suffering goes on and on, the fact remains that Yemen does not have a functioning government anywhere.